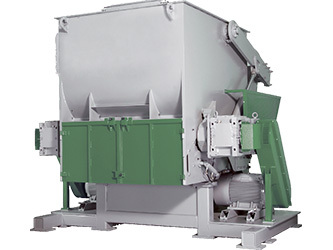 The V series shredders are single shaft shredders with a large internal volume. The redesigned hydraulic pusher system creates about 35% more space in the cutting chamber while increasing the power and speed of the ram itself. The machines are equipped with a 457 mm diameter Virtus Equipment E rotor with widths ranging from 1200 to 2000 mm. As on the G machines the rotor is driven via an oversized gearbox. The completely closed welded steel housing increases the stability and avoids material spillage. The V inherits all of the advantages of the Virtus Equipment knife and knife holder design as well as standard features such as outboard bearings, hydraulic screen cradle, it’s easy maintainability and advanced controls. The V shredders have been designed with big volume parts such as IBCs, pallets, big barrels and large scale biomass material. While it can be used for in-house recycling operations, it is also versatile enough to be used for general recycling in the post-consumer waste and wood industry. Like all Virtus Equipment shredders the W can be equipped with a wear package for processing of highly abrasive or filled materials. The internal ram design on the V series allows the cutting chamber volume to be increased while keeping a small footprint. Making the V ideal for shredding of big volume parts.